YDZ series constant-power change-pole multi-speed three phase induction motors are matched with the augers for the basic engineering of architecture. It can be as the auger power source for the architecture in city construction, bridge, port, embankment etc. 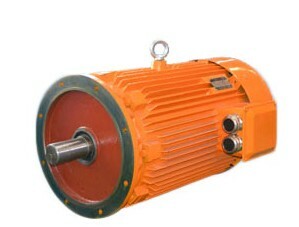 YDZ series motors may change the poles through changing the stator winding’s connection, in order to achieve multi-speed, and have the same power under the two kinds of speed. During the construction, the motors speed can be chosen according to the working state for the augers, so that it can improve the construction efficiency, fasten the construction speed and save energy. The motors can be made into one-speed motors too. YDZ series motors have high locked-rotor torque, high overload capability, and the max and locked-rotor torque multiple being more than 3 times under low speed, so that they can accord with the working of augers under various conditions. If meeting special complex stratum, construction can be run because of the motors characteristic. YDZ series motors can burden vibration and shock because of the higher mechanical intension. Motors degree of protection is IP54, IP55 for the terminal box. They are suitable for the augers working under various surroundings. YDZ series motors insulation class is F, and they have high running reliability. YDZ series motors basic mounting type is V1. Terminal box is at no-driving end, and there are two lead in wire entries adown in order to connect winding easily. The rated voltage is 380V and the frequency is 50 Hz. 1)、When ordering, Please record the type, rated power, rated voltage, rated frequency, speed, and so on. 2)、If you have special demands, please confer with us on your demands.